Sarah, the wife of Abraham, was the first mother of our people. Sarah Imeinu, Sarah our Mother, our Matriarch. She is known as someone to emulate, someone to look up to, someone to respect and honor. But who was this woman, really? What made Sarah tick? What was she like? What were her values and beliefs? Where did she come from? And ultimately, what can we learn from her and relate to our lives as Jewish women today? The city of Ur Kasdim, the Sumerian city of Ur, was a cosmopolitan oasis in the midst of a chaotic and dangerous desert region. It experienced its peak from approximately the year 2700 to the 4th century BCE. When excavated in the 1920s and ’30s, it was found that the city had ziggurats, an entire temple area, and both residential and commercial sections. Their religion was polytheistic, and it would have appeared to the populace that they were indeed blessed by the gods. There was a royal cemetery which was found to contain treasures of gold, silver, bronze and precious stones. There were also thousands of tablets containing cuneiform writings of both administrative and literary importance, showing that the people of the city were largely educated. She was not a girl following her heart, but a woman following her soulIt was at the height of this city’s life that Sarah, daughter of Haran, was born and raised. And it was from this city that she fled into the desert with her husband, Abraham, to live a comparatively monastic existence as a nomadic tent-dweller and preacher of the One G‑d. So why would a cosmopolitan girl like Sarah do a crazy thing like that? Was she just a lovesick girl, willing to follow her dashing preacher husband into the desert? All of these answers are found within the pages of the Torah, and they are further discussed amongst the sages of the Talmud, biblical commentators and mystics across the ages. The greatest insight we can gain into this woman is, most interestingly, in her name. As learned from the Torah, words and names are not given haphazardly. In most cases, we can find very clear meaning and insight into something or someone based on the name. So it is not superfluous that Sarah had, in fact, three names in her lifetime. It appears that each time Sarah changed her name, it was symbolic of a greater spiritual refinement. Thus, we can assume that Sarah went through three transformations in her life, each reflected in a name change. There are two qualities for which Sarah is most noted by the sages of the Torah: her prophecy and her beauty. It is written that as a young girl she was known as Yiscah, which literally means “to see.”1 There are two interpretations as to why this name was given to Sarah. First, she is said to have been born blessed with divine inspiration. Second, it is said that she was exceedingly beautiful to behold.2 Both of these attributes deal with sight. The first being a spiritual sight that Sarah herself possessed, which clearly affected the way she perceived the world; and the second, regarding how the rest of the world perceived her. Yiscah, however, was a name that stayed with Sarah only when she was a young girl, after which she was never referred to as Yiscah again. It is written that she herself changed her name.3 Once she grew up and understood modesty, she never allowed herself to be gazed upon by others. The name she chose thereafter, Sarai, literally means “my princess.” With this name change she decided to go from being Yiscah to Sarai, taking herself from being “seen” by all to having the more private and elevated quality of royalty. Sarah is likewise considered to be the mother of every convert to JudaismThis first transformation did not only symbolize her newfound adolescent modesty, but it was also a realization that she was to begin a line of aristocracy—the nation of Israel. This shows the level of her prophecy. She was still a girl who had yet to even meet her husband, but she saw the divine path before her. Siftei Chachamim, a famed 17th-century Torah commentator, writes that Sarah’s level of prophecy was actually superior to that of Abraham. It is known that he came to the revelation of the one G‑d on his own, and even destroyed his father’s idols. But his original name, Abram, means “father of a nation.” It was not changed until much later, when he received the divine letter hei from G‑d before finding out he was to have a son. It was at the same time that his wife received her third name, from Sarai (“my princess”) to Sarah (“princess”). Most of the time we know Sarah, she is called Sarai, “my princess.”6 She was called this because she was the princess of her house and of her tribe. It is as Sarai that she does some of her most prolific work. 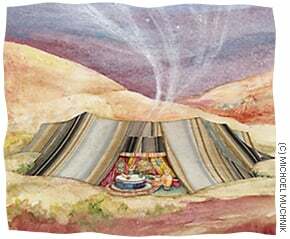 While having shed the name Yiscah, Sarai retained its essence in her coreThere are many examples in the Torah of Sarah’s hospitality to guests, as well as to her followers. Sarah’s tent was no ordinary dwelling. Its doors were open to everyone, and G‑d’s miracles abounded. A light would be lit from one Shabbat eve to the next. There was a blessing in her dough, and it would rise miraculously. And a cloud was stationed over her tent.10 These miracles lasted throughout Sarah’s life, and ceased when she took her last breath. They would return only later, when her son, Isaac, brought his bride, Rebecca, to his mother’s tent. But that is another story. Throughout the time she was known as Sarai, she continuously showed her royal nature and embraced her role as founder of a nation. However, what made her a truly gifted and insightful ruler was that, while having shed the name Yiscah, Sarai retained its essence in her core. And she demonstrated clearly that the gift of prophecy remained with her throughout her days. The birth of a child was all that was needed to secure Sarah’s pedigree. It was significant because not only did it show that Sarah was powerful in the natural world and had secured the dynasty, but, considering her age, it proved that she was a woman worthy of the greatest of miracles. All the infants nursed by her were rewarded in this world, and grew to be rulersAnd, in fact, G‑d performed many miracles for Sarah related to the birth of Isaac. Although she was ninety and had obviously aged, her hair turned black again.15 It is also said that she experienced no pains during childbirth.16 To disprove wagging tongues, Isaac was created in the image of his father.17 Further, G‑d dried up the breasts of all noblewomen, so that they had to bring their babies to Sarah to nurse. She had an abundance of milk and nursed them all. It is said that the infants nursed by her were rewarded in this world, and grew to be rulers. All of these miracles were performed by G‑d to ensure that the parentage of Isaac would be indisputable as being both legitimate and miraculous. And only this allowed her to truly begin the dynasty of Abraham and Sarah, thus fulfilling her destiny of being a princess to the nations. The Torah writes, “Sarah’s lifetime was one hundred years, and twenty years, and seven years.”18 According to the biblical commentator Rashi, the years are split up to emphasize that she was as beautiful and pure of sin at her death as when a child. Sarah’s royal, caring nature, and her strength as a prophetess, had become well known throughout the land, and because of her popularity, her loss was mourned not only by Abraham and his household but by all the inhabitants of Canaan. Her loss was profound, because all of her surroundings had benefited in her merit.19 Even though she was a mother for a relatively short portion of her life, she is known forever as the mother of a nation. She left the world a changed place because of her strength and insight. Sarah, our mother, was quite the “modern” woman. She led her life with a clear vision and purpose. She had the courage to follow her own convictions, no matter how progressive they were at the time. She led her life as a role model for women of her era . . . as well as our own. Sarah can teach the modern Jewish woman a thing or two. We must seek truth in our world, and not be afraid to live according to those truths. And we must not be afraid to speak up when those truths are questioned. We must know that we have inherited a gift from our mother Sarah, and passed down through the generations of mothers following her. We must live our lives as if we, too, can change the world. Ben Ish Chai, Benayahu and Ben Yehoyada to Megillah ibid. Mishneh Torah, Hilchot Bikkurim 4:3. Talmud, Berachot 13a; Genesis Rabbah 47:1. Tana D’vei Eliyahu Rabbah 6. Nechama Rubinstein was raised on the Caribbean island of Bonaire, and now resides in downtown Fort Lauderdale, with her rabbi/law-student husband and two children. She has a personal interest in children’s cancer research, and enjoys advocating for natural birthing and working on her in-progress collection of short stories. I loved this!! Just some weeks ago, I was sharing with some sisters over at church about how we are asked to emulate sarah. It was a fruitful session and we were planning to continue it as soon as we can. I am happy i stumbled upon this and I can't wait to share this link with them!!! Ladies in current day business Hi everyone and thank you for the info regarding Sarah. Most enlightening. I have just been listening to a podcast from BBC Radio Wales: All Things Considered. 10 March 2013. Women and Faith (and their role in society from the perspective of 3 faiths). Brilliant podcast. On to Sarah; she is mentioned as a role model in the bible (and I agree). As a male I would like to ask the opinion of my learned colleagues out there as to their opinion of the role of Ladies in the current day society. Has the role of the Lady in the household been eroded with the current business climate and the fact that Ladies are tasked with leading major companies? I often wonder whether this has been to the benefit of Ladies or to their detriment in this male-centric society.